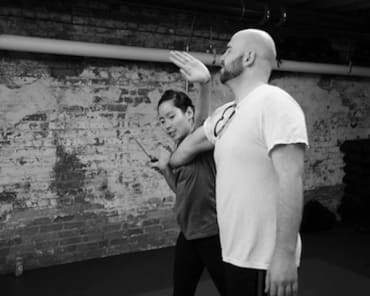 I recently took the Women's Self-Defense class and was thoroughly impressed at the instructor's knowledge, ability to offer individual feedback, easy-to-follow directions and the pace of the class. I think all of the women left the class with better knowledge of how to approach an attacker and an increased level of confidence in their personal strength. I decided to join after such a positive experience - the convenience of two locations is very beneficial to me. I look forward to learning even more self-defense skills and some fantastic workouts. Great place to train with very professional instruction. Flexible schedule for classes and great people make this the #1 Krav studio in the area. Give it a try, you won't regret it! This is my second week at Krav Maga Raleigh. In this short amount of time I feel more aware of my body and know the confidence will come. The instructors are patient and conscious of the student levels adjusting without taking away from the more experienced folks. I highly recommend this place! I first came to Krav Maga Raleigh through the 6 week fitness challenge. I was looking for something different to get me motivated and fit--and those fitness classes 3x a week did it for me! 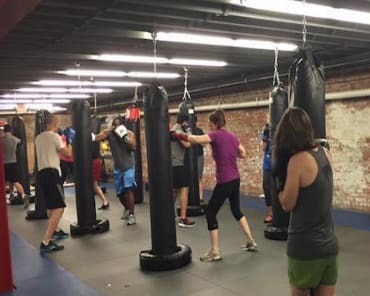 Cassie was my instructor throughout the 6 weeks, but after wrapping up the challenge, I signed up for membership; the idea of not being able to punch a bag was awful and it became therapy during my time in school! The instructors are encouraging and work with you every step of the way-you just have to do the work. It's a really fun and diverse environment to be in as you'll see people of all ages come to get fit. Also, its true, you end up feeling like you're around family with all the support you receive! Great place and even better people! Beginners to advanced everyone is challenged.